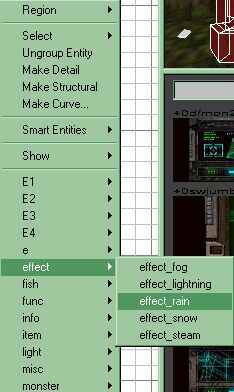 This *very short* tutorial will demonstrate how to use effect_rain, typically implemented for outdoor weather effects, to simulate water falling from a pipe. First build a downward-opening pipe using PRIMITIVES - CYLINDER. Then drag a brush into the space underneath, touching the pipe and the floor on the vertical plane and making sure the horizontal boundaries stay smaller than the pipe diameter (you don't want it to look like water is falling out of the pipe, outside of the pipe). 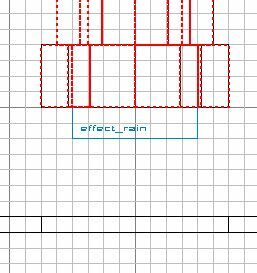 Once your rain brush is set (and ensuring that this brush stays selected), then right click to the entities menu and select effect - effect_rain. This will alter your brush so that it's along the top of the area where the rain will fall, and is only 8 units thick. That's it. Compile your map, and you'll have a downward pipe with water falling out of it.